It’s becoming more and more clear to me that I am better suited to the freedoms of embroidery over counted cross stitching. This is actually a bit on the surprising side since I generally crave order and symmetry. But alas, I am not the most patient of people. Take this bear that I’m working on now, for example. I had so much trouble putting the browns in the right spot (and picking up the right color) and those pink spots on her dress… so endlessly frustrating. I went and put the “W” in with in the wrong spot — which put the whole word in the wrong place. Thankfully it’s only those four letters that need to be moved. But I was so sure I was going to be done last night. Of course, this is one of those ideas that I have in my head — next I am hoping to do a duck — so I am Determined to get this done. 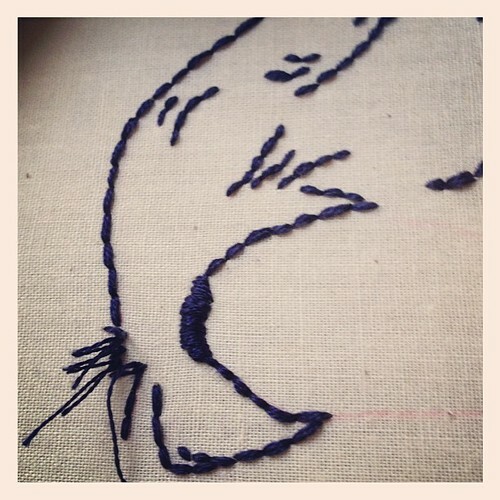 There will be some companion pieces — embroidery ones. I am saving those for the end both because I only have a sense of what I want them to be and because I will enjoy them more. I keep hoping that with practice I will be better. 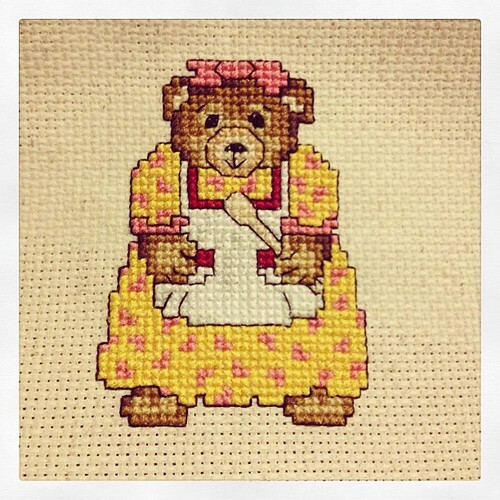 I take the same approach with cross stitch as I do with other things and here it amounts to count twice & stitch once. Only it’s more like count six times, stitch three. Sigh. I will be glad to get this one done so I can move on. Here’s to not giving up. I decided that I’d move my things into the room that served as nursery for both the kids (they now share a bedroom with bunk beds and everything) which is now our guest room. It still held a lot of baby bits/memorabilia that we haven’t used in ages. It needed a good bit of organizing, some new curtains, and then I had to go around the house and gather up all of my supplies and fabrics and hoops and whatnot. This is the end result for now. A lot of the baskets on the shelves are just hiding things: soccer trophies, porcelain dolls, and other little items that need to be gone through. Still, I’m much happier to have all my things in a single place. All my crafty books, inspirational books and books for chopping up. My mother’s sewing machine that I keep meaning to re-remember how to use. And all my little bits and pieces that I have become so fond of. Since it’s the New Year and everything, I thought it would be good to write down a few things that I’ve been wanting to accomplish and/or become better at doing. Firstly, actual blogging. It’s been fits and starts for a while now. I don’t know that I want to set an actual schedule, but I’m thinking I can post more frequently than once or twice a month (which is the average around here). December was a good start. Six whole posts all in the same month. 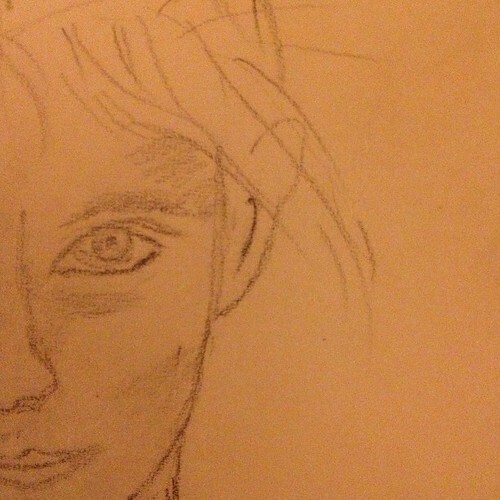 Secondly, I would like to be a better drawer. Doodling shapes and squiggly lines is one thing — and don’t get me wrong, I adore both of those things — but I would really like to be better at actual drawing of real things. Thus, I embarked on a little adventure last night. It really started out as a tracing exercise — I’ve drawn on vellum over a photograph — but it’s still a bit tricky. Further, as I go along and stitch I need to reference both the drawing I made and the actual photo. So it’s not all just trace and go. I don’t want to sell myself short because I think there’s a fair amount of skill that I’m using here, but I did not draw from scratch. Still, practice is practice and I know the more I do it, the better I’ll become. I am casually looking for a class here and there, but nothing right has come up so far. Her name is Rosie, and that’s all I’ll say until it’s finished — I don’t want to spoil it. I’m saving the harder bits — hands, face and hair — for last. 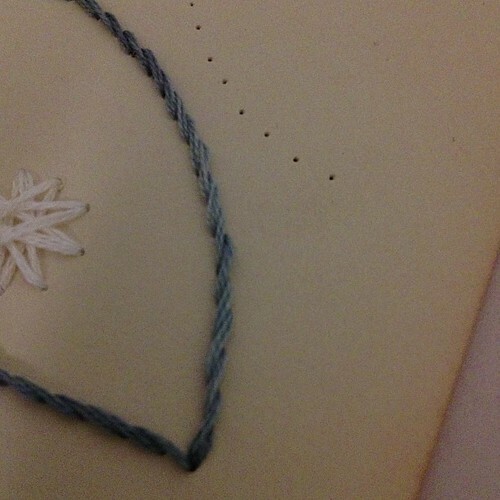 So far, I’ve used just about a skein of floss and three types of stitches. I’m planning on at least two or three other stitches, and a bunch more floss. More ideas than I know what to do with! This Christmas I got some lovely stitchy presents, including the stand pictured above. I’m excited to have it and looking forward to working on some larger pieces without a lot of shoulder pain. I’ve been testing it out, and getting the height and angle right. At the same time, I am working on another idea that I have cooking. I think this particular idea will be much longer term. 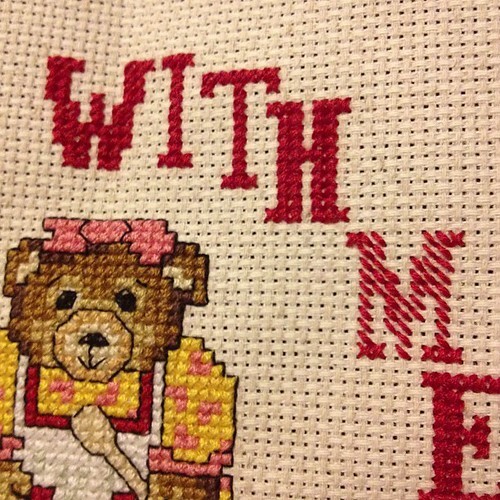 I still haven’t nailed down exactly what I want to stitch, but I know how I want it to feel. Olisa just posted about having a vision and editing and loving the process. I couldn’t agree more. I can’t wait to get started on everything!